East Hanover, N.J., May 1, 2018 – Novartis today announced the US Food and Drug Administration (FDA) has approved Kymriah® (tisagenlecleucel) suspension for intravenous infusion for its second indication – the treatment of adult patients with relapsed or refractory (r/r) large B-cell lymphoma after two or more lines of systemic therapy including diffuse large B-cell lymphoma (DLCBL), high grade B-cell lymphoma and DLBCL arising from follicular lymphoma. Kymriah is not indicated for the treatment of patients with primary central nervous system lymphoma. 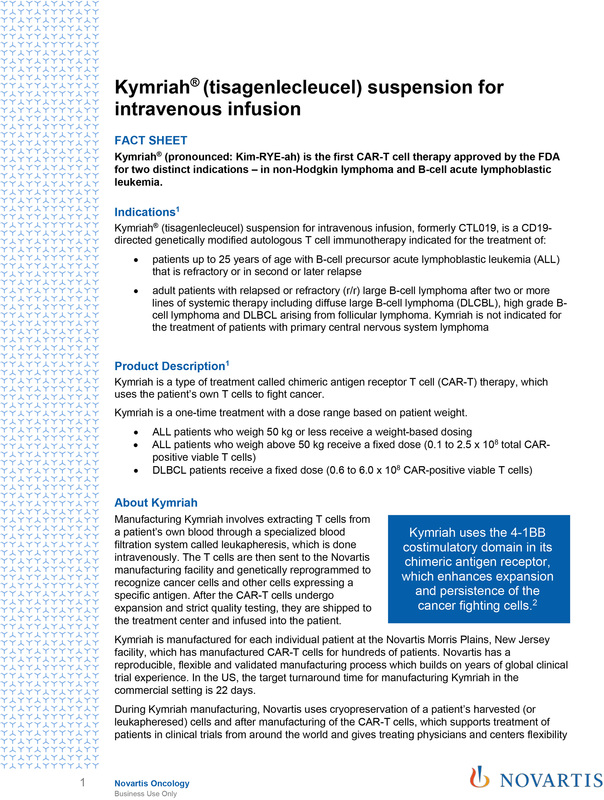 Kymriah, developed in collaboration with the University of Pennsylvania, became the first chimeric antigen receptor T cell (CAR-T) therapy to receive regulatory approval in August 2017 for the treatment of patients up to 25 years of age with B-cell precursor acute lymphoblastic leukemia (ALL) that is refractory or in second or later relapse. Kymriah is now the only CAR-T cell therapy to receive FDA approval for two distinct indications in non-Hodgkin lymphoma (NHL) and B-cell ALL. 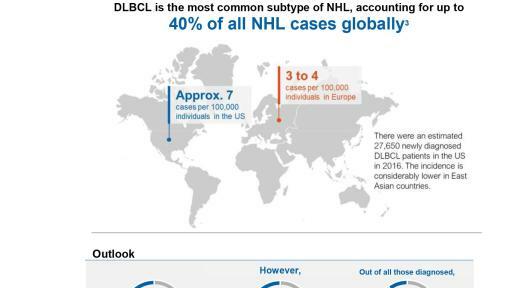 DLBCL is the most common form of NHL2,3. For patients who relapse or don’t respond to initial therapy, there are limited treatment options that provide durable responses, and median life expectancy is approximately six months4,5. 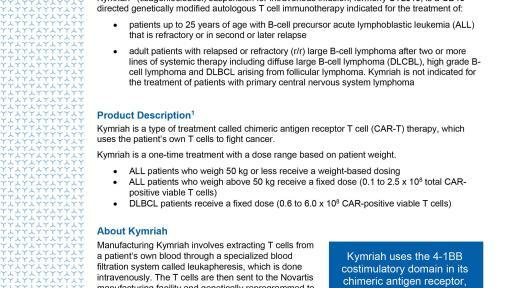 Kymriah is an innovative immunocellular therapy that is a one-time treatment manufactured individually for each patient using the patient’s own T cells. Kymriah uses the 4-1BB costimulatory domain in its chimeric antigen receptor to enhance cellular expansion and persistence. In 2012, Novartis and Penn entered into a global collaboration to further research, develop and commercialize CAR-T cell therapies, including Kymriah, for the investigational treatment of cancers. As part of the Novartis commitment to ensure eligible patients have access to Kymriah, the company continues to collaborate with the Centers for Medicare and Medicaid Services (CMS) on the creation of an appropriate value-based pricing approach. Novartis continues to be an innovator and leader in value and innovative-based pricing options, and is proud to work with CMS and other stakeholders across the healthcare spectrum on creating a sustainable and modern healthcare payment system. To ensure all hospitals and their associated clinics are aware of how to manage the risks of cytokine release syndrome (CRS) and neurological toxicities, Kymriah is available through a Risk Evaluation and Mitigation Strategy (REMS) program. The REMS program serves to inform and educate healthcare professionals about the risks that may be associated with Kymriah treatment. 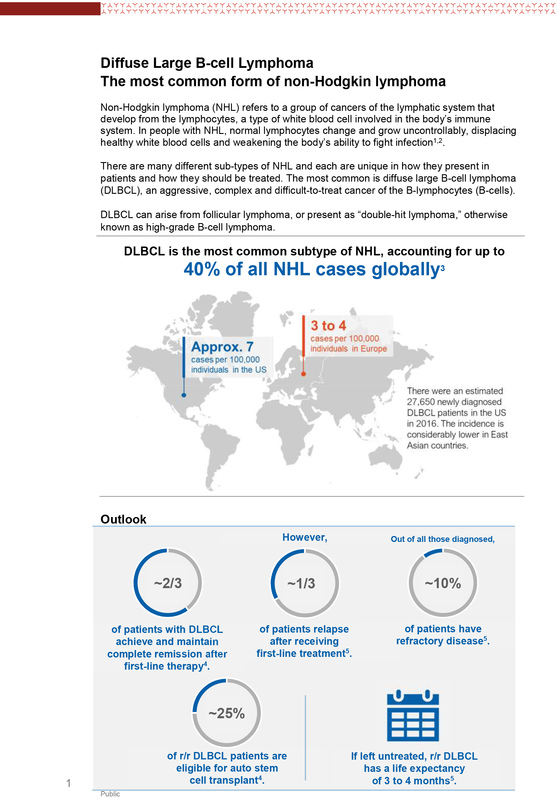 To support safe patient access, Novartis has established a network of certified treatment centers throughout the country, which are fully trained on the use of Kymriah and appropriate patient care, and there are currently treatment centers which are certified and fully operational to begin treatment of eligible patients with DLBCL. To address the unique aspects of this therapy, Novartis offers various patient programs and resources to support safe and timely access for patients and address a range of needs. Novartis is also committed to bringing Kymriah to patients outside the US. 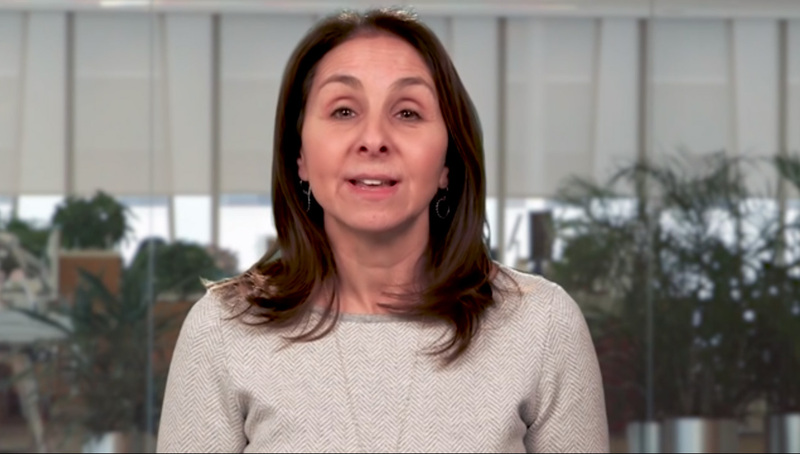 In January 2018, Novartis announced that the European Medicines Agency (EMA) granted accelerated assessment to the Marketing Authorization Application (MAA) for Kymriah for the treatment of children and young adults with r/r B-cell ALL and for adult patients with r/r DLBCL who are ineligible for ASCT. Accelerated assessment is granted to therapies which may provide a significant improvement in the safety and effectiveness of the treatment of a serious disease, and the designation is intended to expedite the standard review time. Novartis plans additional regulatory submissions for Kymriah in pediatric and young adult patients with r/r B-cell ALL and adult patients with r/r DLBCL beyond the US and EU in 2018. 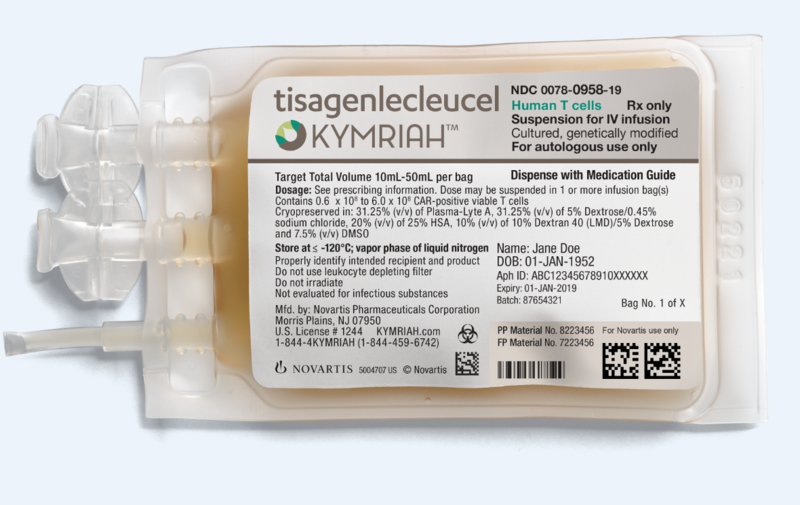 The FDA approval of Kymriah in adult patients with r/r DLBCL is based on the pivotal phase II JULIET clinical trial, the first multi-center global registration study for Kymriah in adult patients with r/r DLBCL. JULIET was conducted in collaboration with Penn, and is the largest study examining a CAR-T therapy in DLBCL, enrolling patients from 27 sites in 10 countries across the US, Canada, Australia, Japan and Europe, including: Austria, France, Germany, Italy, Norway and the Netherlands. In the JULIET trial, patients were infused in the inpatient and outpatient setting. In this Novartis-sponsored study, Kymriah showed an overall response rate (ORR) of 50% (95% confidence interval [CI], 38% - 62%), with 32% of patients achieving a complete response (CR) and 18% achieving a partial response (PR) in 68 patients evaluated for efficacy. The median duration of response was not reached among these patients, indicating sustainability of response1. In all patients infused with Kymriah (n=106), severe or life-threatening (grade 3/4) CRS, defined by the Penn Grading Scale -a rigorous scale for grading this reaction-, occurred in 23% of patients. CRS is a known complication of CAR-T therapy that may occur when the engineered cells become activated in the patient's body. CRS was managed globally using prior site education on implementation of the CRS treatment algorithm. Eighteen percent of all infused patients experienced grade 3/4 neurologic events, which were managed with supportive care. Encephalopathy, a distinctive neurotoxicity associated with CAR-T therapies, was seen as severe or life-threatening in 11% of patients. There were no deaths attributed to neurological events, and no fatal cases of cerebral edema have occurred. Grade 3/4 cytopenias lasting more than 28 days included thrombocytopenia (40%) and neutropenia (25%), and grade 3/4 infections occurred in 25%. The most common (>20%) adverse events (AEs) in the JULIET study are CRS, infections, pyrexia, diarrhea, nausea, fatigue, hypotension, edema and headache1. Kymriah is manufactured for each individual patient using their own cells at the Novartis Morris Plains, New Jersey facility. In the US, the target turnaround time for manufacturing Kymriah is 22 days. The reliable and integrated manufacturing and supply chain platform for Kymriah allows for an individualized treatment approach on a global scale. The process includes cryopreservation of a patient’s harvested (or leukapheresed) cells, giving treating physicians and centers the flexibility to initiate therapy with Kymriah based on the individual patient’s condition. Novartis has significant CAR-T manufacturing experience and has demonstrated a reproducible product. 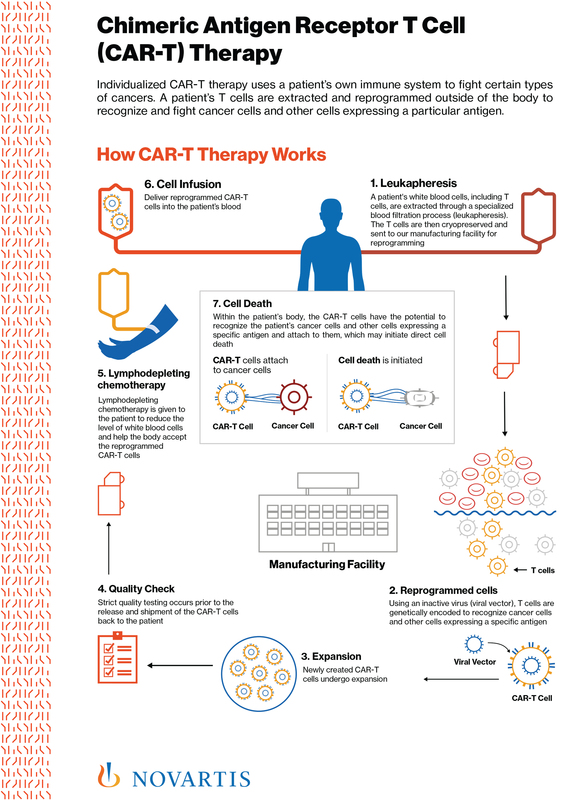 Novartis has manufactured CAR-T cells for more than 300 patients from 11 countries. Novartis continues to advance its CAR-T manufacturing expertise in Morris Plains where we have been supplying CAR-T cells for global clinical trials and where we continue to invest in support of the anticipated demand to meet the needs of patients. Novartis has also successfully established the Kymriah manufacturing process at the Fraunhofer-Institut for cell therapy and immunology (Fraunhofer-Institut für Zelltherapie and Immunologie) facility in Leipzig, Germany, which currently supports the manufacturing of Kymriah for global clinical trials. Novartis is at the forefront of investigational immunocellular therapy as the first pharmaceutical company to initiate global CAR-T trials, and has significantly invested in CAR-T research and worked with pioneers in the field. 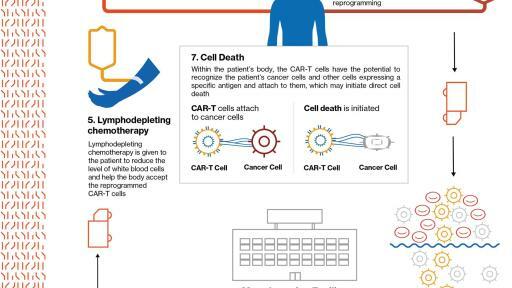 Kymriah, the first approved CAR-T cell therapy, is the cornerstone of this strategy. Active research programs are underway targeting other hematologic malignancies and solid tumors, and include efforts focused on next generation CAR-Ts that involve simplified manufacturing schemes and gene edited cells. Kymriah may cause side effects that are severe or life-threatening, such as Cytokine Release Syndrome (CRS) or Neurological Toxicities. Patients with CRS may experience symptoms including difficulty breathing, fever (100.4◦F/38◦C or higher), chills/shaking chills, severe nausea, vomiting and diarrhea, severe muscle or joint pain, very low blood pressure, or dizziness/lightheadedness. Patients may be admitted to the hospital for CRS and treated with other medications. Patients with neurological toxicities may experience symptoms such as altered or decreased consciousness, headaches, delirium, confusion, agitation, anxiety, seizures, difficulty speaking and understanding, or loss of balance. Patients should be advised to call their healthcare provider or get emergency help right away if they experience any of these signs and symptoms of CRS or neurological toxicities. Because of the risk of CRS and neurological toxicities, Kymriah is only available through a restricted program under a Risk Evaluation and Mitigation Strategy (REMS) called Kymriah REMS. Serious allergic reactions, including anaphylaxis, may occur after Kymriah infusion. Kymriah can increase the risk of life-threatening infections that may lead to death. Patients should be advised to tell their healthcare provider right away if they develop fever, chills, or any signs or symptoms of an infection. Patients may experience prolonged low blood cell counts (cytopenia), where one or more types of blood cells (red blood cells, white blood cells, or platelets) are decreased. The patient’s healthcare provider will do blood tests to check all of their blood cell counts after treatment with Kymriah. Patients should be advised to tell their healthcare provider right away if they get a fever, are feeling tired, or have bruising or bleeding. Patients may experience hypogammaglobulinemia, a condition in which the level of immunoglobulins (antibodies) in the blood is low and the risk of infection is increased. It is expected that patients may develop hypogammaglobulinemia with Kymriah, and may need to receive immunoglobulin replacement for an indefinite amount of time following treatment with Kymriah. Patients should tell their healthcare provider about their treatment with Kymriah before receiving a live virus vaccine. After treatment with Kymriah, patients will be monitored lifelong by their healthcare provider, as they may develop secondary cancers or recurrence of their cancer. Patients should not drive, operate heavy machinery, or do other dangerous activities for eight weeks after receiving Kymriah because the treatment can cause temporary memory and coordination problems, including sleepiness, confusion, weakness, dizziness, and seizures. Some of the most common side effects of Kymriah are difficulty breathing, fever (100.4°F/38°C or higher), chills/shaking chills, confusion, severe nausea, vomiting and diarrhea, severe muscle or joint pain, very low blood pressure, dizziness/lightheadedness, and headache. However, these are not all of the possible side effects of Kymriah. 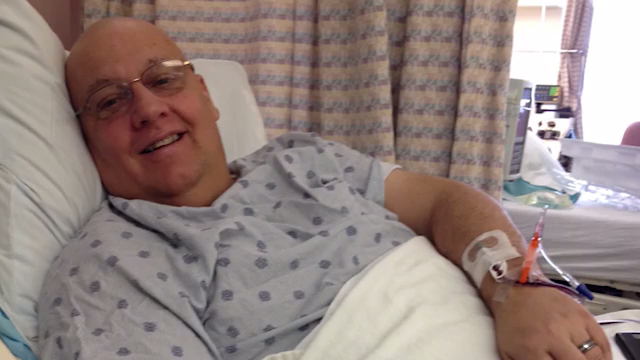 Patients should talk to their healthcare provider for medical advice about side effects. Prior to a female patient starting treatment with Kymriah, their healthcare provider may do a pregnancy test. There is no information available for Kymriah use in pregnant or breast-feeding women. Therefore, Kymriah is not recommended for women who are pregnant or breast feeding. Patients should talk to their healthcare provider about birth control and pregnancy. After receiving Kymriah, patients should be advised that some commercial HIV tests may cause a false-positive test result. Patients should also be advised not to donate blood, organs, or tissues and cells for transplantation after receiving Kymriah. This press release contains forward-looking statements within the meaning of the United States Private Securities Litigation Reform Act of 1995. Forward-looking statements can generally be identified by words such as “potential,” “can,” “will,” “plan,” “expect,” “anticipate,” “look forward,” “believe,” “committed,” “investigational,” “pipeline,” “launch,” or similar terms, or by express or implied discussions regarding potential marketing approvals, new indications or labeling for Kymriah or the other investigational products described in this press release, regarding our ability to scale and sustain commercial manufacturing for Kymriah or such other products, or regarding potential future revenues from Kymriah and such other products. You should not place undue reliance on these statements. Such forward-looking statements are based on our current beliefs and expectations regarding future events, and are subject to significant known and unknown risks and uncertainties. Should one or more of these risks or uncertainties materialize, or should underlying assumptions prove incorrect, actual results may vary materially from those set forth in the forward-looking statements. There can be no guarantee that Kymriah or the other investigational products described in this press release will be submitted or approved for sale or for any additional indications or labeling in any market, or at any particular time. Neither can there be any guarantee that Novartis will successfully scale and sustain commercial manufacturing for Kymriah or the other products described in this press release, or successfully sustain a network of treatment centers to offer Kymriah. Nor can there be any guarantee that Novartis will successfully establish and implement indication-based pricing for Kymriah or the other investigational products described in this press release, or that such indication-based pricing will achieve the intended goals of such pricing. Neither can there be any guarantee that Kymriah and such other products will be commercially successful in the future. In particular, our expectations regarding Kymriah and such other products could be affected by, among other things, our ability to successfully scale and sustain commercial manufacturing and sustain a network of treatment centers; our ability to successfully establish and implement indication-based pricing; the uncertainties inherent in research and development, including clinical trial results and additional analysis of existing clinical data; regulatory actions or delays or government regulation generally; global trends toward health care cost containment, including government, payor and general public pricing and reimbursement pressures; our ability to obtain or maintain proprietary intellectual property protection; the particular prescribing preferences of physicians and patients; general political and economic conditions; safety, quality or manufacturing issues; potential or actual data security and data privacy breaches, or disruptions of our information technology systems, and other risks and factors referred to in Novartis AG’s current Form 20-F on file with the US Securities and Exchange Commission. Novartis is providing the information in this press release as of this date and does not undertake any obligation to update any forward-looking statements contained in this press release as a result of new information, future events or otherwise. Located in East Hanover, NJ Novartis Pharmaceuticals Corporation is an affiliate of Novartis which provides innovative healthcare solutions that address the evolving needs of patients and societies. Headquartered in Basel, Switzerland, Novartis offers a diversified portfolio to best meet these needs: innovative medicines, cost-saving generic and biosimilar pharmaceuticals and eye care. Novartis has leading positions globally in each of these areas. In 2017, the Group achieved net sales of USD 49.1 billion, while R&D throughout the Group amounted to approximately USD 9.0 billion. Novartis Group companies employ approximately 122,000 full-time-equivalent associates. Novartis products are sold in approximately 155 countries around the world. For more information, please visit http://www.novartis.com. 1. 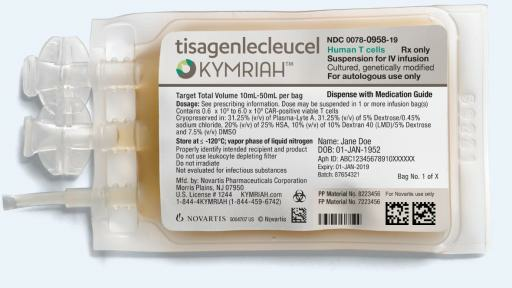 Kymriah (tisagenlecleucel) Prescribing information. East Hanover, New Jersey, USA: Novartis Pharmaceuticals Corporation; May 2018. 2. Vacirca JL et al., Ann Hematol. 2014;93(3):403-409. 3. American Society of Clinical Oncology. Lymphoma - Non-Hodgkin: Subtypes (Dec. 2016 revision). http://www.cancer.net/cancer-types/lymphoma-non-hodgkin/subtypes. Accessed May 2018. 4. Raut, L., Chakrabarti, P. "Management of relapsed-refractory diffuse large B cell lymphoma." South Asian J Can, 2014 Jan-Mar; 3(1): 66-7. Accessed May 2018. 5. Crump M et al., “Outcomes in refractory diffuse large B-cell lymphoma: results from the international SCHOLAR-1 study”, Blood. 2017 Oct 19;130(16):1800-1808. Available on https://www.ncbi.nlm.nih.gov/pubmed/28774879. Accessed May 2018.